The first Sunday of 2018 was a delight for football fans in India as it saw Delhi dynamos square off against Chennaiyin FC and Bengaluru FC face Atletico de Kolkata. The doubleheaders saw a day filled with superb football that threw out some exciting football. Delhi and Chennai played out a dramatic draw in the first match of the day with both teams sharing four goals between them. In the latter game of the day, it was business as usual for Bangalore who romped on to another win to stay top of the pile. The Jawaharlal Nehru Stadium in Chennai played host to the evening match and saw struggling Delhi take on a strong Chennai team. Sitting rock bottom of the league standings the Delhi team was in desperate need of a win as they looked to move up on the table. And they came out with attacking intent against a Chennai side that has pushed above their weight this season and put in some good performances to stay in the top 3 throughout the season. It was a cracker of a match which saw both teams score two goals each. Delhi shocked the home crowd as they took the lead via David in the 24th-minute credit to the full throttle football they played from the starting whistle. It wasn’t before long though that Chennai’s star striker Jeje scored a brace with goals in the 42nd and 51st minutes to take Chennai to a 2-1 lead against the visitors. Delhi’s determination paid off and they got a well-deserved draw on the day as Fernandez scored in the last minutes of the match to get the equalizer for Delhi. The result saw Chennai gain a point and move above Pune to second in the league standings. 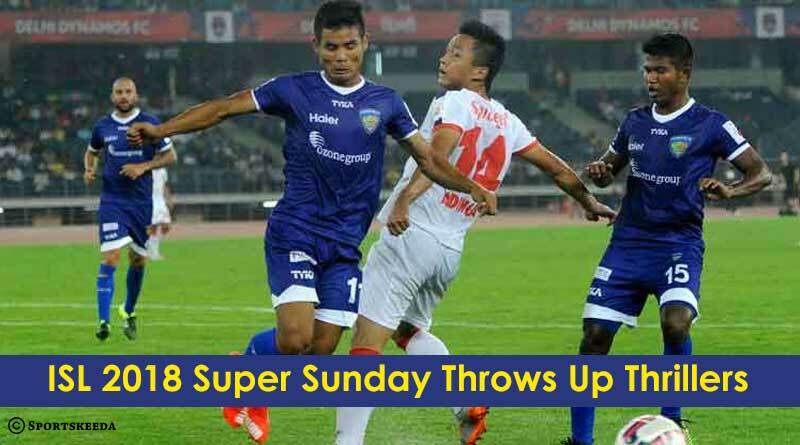 The second and final match of the Super Sunday saw Bengaluru FC carry out usual proceedings. The table toppers went on to win another match as they edged past Kolkata 1-0 at the Sree Kanteveera Stadium to set the pace for others and remain on top of the table. A well-taken goal by Sunil Chettri in the first half saw them seal a drab match which saw both sides create very little chances.